The invention relates to a touch device which comprises a touch panel component, two switch gears and a bridging structure. The bridging structure is arranged in the middle of the touch panel component, and is divided into a first region and a second region, wherein the first region and the second region are respectively arranged on two opposite sides of the bridging structure and are suspended. The two switch gears are arranged corresponding to the first region and the second region respectively and accordingly can be triggered by vertical floatation of the first region and the second region. The invention further relates to electronic equipment with the touch device. [0001 ] 本发明涉及一种触控装置及带有触控装置的电子设备。  The present invention relates to a touch device and an electronic device with a touch device. 随着电子科技的迅猛发展，人们对电子设备的要求与期望也越来越趋向于简便与舒适化，对于现有电子设备(例如，笔记本电脑）的触控装置是在触控板的前侧增加左右键按钮实现选择功能，然而，左右键按钮占据一定空间，使得尺寸一定的情况下触控板面积受到一定限制，也影响了美观。  With the rapid development of electronic technology, people's demands and expectations electronic devices increasingly tend to be simple and comfort of, for existing electronic devices (eg, laptops) touch devices is the touchpad left and right front side of the increased key buttons to select PC, however, occupy a certain space around the key buttons, so that under certain circumstances the size of the touch panel area subject to certain restrictions, but also affect the appearance. 鉴于此，有必要提供一种改进的触控装置。  In view of this, it is necessary to provide an improved touch device. 还有必要提供一种带有该触控装置的电子设备。  is necessary to provide the electronic apparatus with a touch device. 本发明涉及一种触控装置，包括触控板组件、二开关装置以及架接结构，该架接结构设置于该触控板组件的中部，将该触控板组件分隔出分别位于该架接结构两相对侧的第一区域与第二区域，并使该第一区域与该第二区域呈悬浮状。  The present invention relates to a touch device includes a touch panel assembly, and a second switching means connected to frame structure, the frame structure is provided connected to the middle portion of the touch panel assembly, the touch panel assembly partitioned located the opposite sides of the frame structure connected to the first and second regions, the first region and in suspension with the second region. 该二开关装置分别与该第一区域以及第二区域对应设置，以分别通过该第一区域以及第二区域的上下浮动触发。 The second switching means provided respectively corresponding to the first and second regions, respectively, to float up and down the first region and a second region of the trigger. 本发明还涉及一种带有该触控装置的电子设备。  The present invention further relates to an electronic apparatus having the touch device is. 本发明通过一架接结构将触控板组件分隔成两个区域，该二开关装置被设置于与该两个区域相对应的位置，并通过该两区域的上下浮动触发。  The present invention, by an attachment structure, the touch panel assembly partitioned into two regions, the second switch means is provided in the region corresponding to the two positions, and the two floating triggered by upper and lower regions. 图I为本发明一些实施例中电子设备的立体示意图。  Figure I a schematic perspective of some embodiments of an electronic apparatus according to the present invention. 图2为图I所示触控装置的立体示意图。  FIG. 2 is a perspective view of a touch device shown in Figure I. 图3为图2所示触控装置的立体分解示意图。  FIG. 3 is a touch device shown in FIG 2 a schematic exploded perspective view. 图4为图3所述触控装置底面朝上的立体分解示意图。  FIG. 4 is a perspective view of the touch device 3 an exploded view of the bottom surface upward. 图5为图2所示触控装置IV - IV方向的剖视图。  FIG. 5 is a touch device shown in FIG. 2 IV - IV cross-sectional view direction. 图I示出了本发明一些实施例中的电子设备的立体图，该电子设备可为一笔记本电脑，其包括本体I与盖体2,该本体I上设置有键盘3以及触控装置4。  Figure I shows some perspective view of an electronic apparatus according to the present invention, the electronic device may be a notebook computer which includes a main body I and the cover 2 is provided on the body I with a keyboard 3 and the touch apparatus 4. 该本体I可为笔记本电脑的主机，该盖体2可为笔记本电脑显示器，可以理解地，在其它一些实施例中，该电子设备也可以是电子书等其它电子设备。 The body I may be laptop host, the cover 2 may be a notebook computer displays, be appreciated that, in some other embodiments, the electronic device may be an electronic book and other electronic devices. 请一并参考图2，该触控装置4在一些实施例中可包括触控板组件41、支架43、开关装置45 (如图3所示）以及设置于触控板组件41与支架43之间的架接结构，该触控板组件41被安装于支架43上，开关装置45可设置于与触控板组件41下方，用以通过触控板组件41的上下浮动触发。  Please refer to FIG. 2, the touch device 4, in some embodiments may include a touch panel assembly 41, the holder 43, the switching means 45 (FIG. 3) and is provided with the touch plate assembly 41 frame structure between the bracket 43, the touch panel assembly 41 is mounted on the holder 43, the switching means 45 may be disposed below the touch plate assembly 41 for vertical floating triggered by the touch panel 41 of the assembly. 请一并参考图3以及图4，该触控板组件41包括触控板410以及用于承载该触控板410的托架412。  Please refer to FIG. 3 and FIG. 4, the touch pad assembly 41 includes a carriage 412 for carrying the touch panel 410 and the touch panel 410. 该触控板410在一些实施例中大体呈矩形，其顶面暴露在本体I外，用于供用户直接触摸并输入操作指令，触控板410底面设有电路板4101，该电路板4101提供给触控板410 —些必要的电路。 Examples of the substantially rectangular touch panel 410, in some embodiments, a top surface exposed outside the body I, for the user to input an operation instruction and a direct touch, the touch panel 410 is provided with a bottom surface of the circuit board 4101, the circuit board 4101 to provide a touchpad 410 - some necessary circuitry. 托架412在一些实施例中可呈一矩形板状，其尺寸与触控板410相适配，该托架412包括开设于中部的第一开口4121、设于周缘的卡固部4123以及设于底面靠近两端的触发部4125(如图4所示)。 In some embodiments, the bracket 412 may form a rectangular plate with dimensions adapted to the touch panel 410, the carrier 412 includes a first opening opened in the middle of 4121, provided on the periphery of the retaining portion 4123 is provided, and close to the bottom ends of the trigger portion 4125 (FIG. 4). 第一开口4121用以收容触控板410上的电路板4101，卡固部4123分别设置于托架412宽度方向的两侧边上，用以卡扣于支架43的相应侧上，防止触控板组件41在外部按压力撤离时向上运动偏离支架43。 On respective sides for accommodating the circuit board 410 on the touch panel 4101, 4123 latching portions are provided on both lateral sides in the width direction of the bracket 412, the bracket 43 for snap-in first opening 4121, to prevent the touch plate assembly 41 moves departing from the stent 43 when the external pressing force upward withdrawal. 触发部4125设置于托架412的长度方向上并位于第一开口4121的两相对侧，用以随触控板组件41的上下浮动来触发相对应的开关装置45。 Trigger portion 4125 is provided on the longitudinal direction of the bracket 412 and positioned in opposite sides of the first opening 4121, to fluctuate with the touch panel assembly 41 to trigger the corresponding switching means 45. 触发部4125的横堆面在一些实施例中可呈十字形。 Lateral stack face trigger portion 4125 in some embodiments may be cross-shaped. 再如图3所示，支架43在一些实施例中可包括一收容槽430、第二开口432、第一穿孔434以及第二穿孔436。  FIG. 3 again, in some embodiments the stent 43 may include a receiving groove 430, a second opening 432, first 434 and second through hole 436 piercing. 该收容槽430大体呈矩形，并由支架43的中间部位向内凹陷而成，其尺寸与托架412的尺寸相匹配，用以收容托架412。 The housing 430 is generally rectangular slot 43 by an intermediate portion of the stent inwardly from the recess, and the bracket is sized to match the size of 412, 412 for accommodating the carriage. 该第二开口432设置于收容槽430内与第一开口4121相对的位置，用以与第一开口4121相配合收容触控板410上的电路板4101。 The second opening 432 is provided in a position opposed to the first opening 4121, opening 4121 configured to mate with the first housing 410 on the circuit board 4101 within the touch panel receiving groove 430. 该第一穿孔434分别设置于与托架412上的触发部4125相对应位置，用以供触发部4125穿过该第一穿孔434与相对应的开关装置45触碰。 The first through hole 434 are provided in the upper portion of the trigger bracket 4,124,125 corresponding position for triggering portion 4125 for the first through hole 434 through the switching means 45 corresponding to the touch. 第二穿孔436开设于收容槽430底面的两侧并与托架412上的卡固部4123的位置相对应，用以供卡固部4123穿过后卡扣在支架43上，防止托架412从支架43上脱离。 Perforations 436 on both sides of the second receiving groove 430 defines the bottom surface and the position of the retaining portion 4123 on the carriage 412 corresponding to the section 4123 for retaining the holder 43 through a snap-in, to prevent the carriage 412 from 43 out of the holder. 可以理解地，在一些实施例中，支架43的边框可与本体I的框体一体成型。 It will be appreciated, in some embodiments, the stent frame 43 may be integrally formed with the housing body I. 架接结构在一些实施例中可呈纵长形，包括设置在触控板组件41上的第一凸台4126以及设置在支架43上的第二凸台438，该第一凸台4126与第二凸台438相对接，将触控板组件41分隔出分别位于该架接结构两相对侧的第一区域SI与第二区域S2，并使该第一区域SI与该第二区域S2呈悬浮状，即第一区域SI与第二区域S2能绕平行于架接结构的轴线上下转动一定角度。  The holder attachment structure in some embodiments may be in a longitudinal shape, on the touch panel comprises a first component 41 and the boss 4126 is provided on the bracket 43, the second boss 438, the first boss 4126 and the second boss 438 relative access, the touch pad assembly 41 of the first partitioned region and the second region S2 SI are respectively located two opposite sides of the holder attachment structure, the first region and the second region SI S2 in suspension, i.e. the first region and the second region S2 SI rotatable about an axis parallel to the rotation angle of the vertical frame attachment structure. 在一些实施例中，第一区域SI与第二区域S2分别为触控板组件41的左右二区域，并借由该二区域的向下移动触发对应的开关装置45，实现该触控装置4的左右键功能。 In some embodiments, the first region and the second region S2 SI are about two touch pad assembly area 41, and corresponding switching means is moved downward by means of the second region 45 of the trigger, the touch means 4 to achieve the left and right buttons function. 该第一凸台4126在一些实施例中呈梯形状，其设置于托架412的中部并横跨于托架412的宽度方向，两相对的端部分别延伸至托架412的两相对侧。  The first boss has a trapezoidal shape 4126] In some embodiments, the middle bracket 412 which is provided across the width direction and the bracket 412, two opposite end portions to the bracket 412 extends two opposite sides. 第一凸台4126的上表面还设置有一凸起4127，该凸起4127可由第一凸台4126上表面的中间部分向上延伸而成并与第一凸台4126形成一阶梯状，凸起4127的表面平整且宽度略小于第一凸台4126的上表面。 Upper surface of the first boss 4126 is also provided with a protrusion 4127, an intermediate portion extending upwardly from the surface and forming a stepped first boss 4126 and the projection 4127 may be formed on the first boss 4126, the protrusions 4127 smooth surface and a width slightly smaller than the upper surface of the first boss 4126. 第一凸台4126 —端的端末上设置有一第一固定部4128,第一凸台4126与第一固定部4128相对的另一端沿其长度方向延伸出一第二固定部4129，该第一固定部4128与第二固定部4129分别将触控板组件41的中部固定。 Duanmo end is provided with a first fixing portion 4128, first boss 4126 and the first fixing portion 4128 opposite end portion projecting a second fixing Fangxiang Yan 4129 along its length, the first fixing portion - projecting a first station 4126 4128 and the middle of the second fixed part 4129, respectively fixation assembly 41 of the touch panel. 第二凸台438设置于支架43上与第一凸台4126相对应位置，凸起4127相对应的放置于第二凸台438的上表面上，触控板组件41的左右两区域被架起处于悬空状态并与支架43之间形成一定间隔。  The second boss 438 is provided on the holder 43 and the first boss 4126 corresponding to the position, corresponding to the projection 4127 is placed on the upper surface of the second boss 438, two right and left area of ​​the touch panel assembly 41 It is set up and formed in a floating state between the holder 43 and spaced apart. 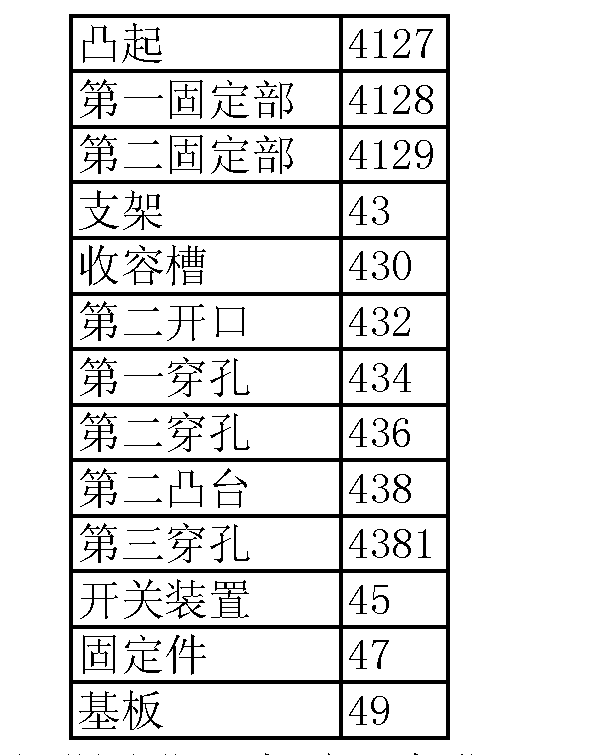 第二凸台438上与第一固定部4128相对应位置开设有第三穿孔4381，一固定件47穿过第三穿孔4381与第一固定部4128配合，将托架412与支架43锁固。 The second projection 438 on the stage and the first fixing portion 4128 defines a corresponding position of the third through hole 4381, a third fixing member 47 through the perforations 4381 and 4128 with the first fixing portion, the bracket 412 and the bracket 43 locked. 固定件47在一些实施例中可为一螺丝。 Fixing member 47 in some embodiments may be a screw. 可以理解地，在另一些实施例中，架接结构414也可仅设置于托架412和支架43两者中的任意一个上的凸台结构，只要能使触控板组件41于架接结构的两相对侧的左与右区域呈悬浮状即可。  It will be appreciated, in other embodiments, the carrier connecting structure 414 may be provided only on the boss structure 412 and any one of both the carrier holder 43 as long as the touch panel assembly 41 to make left and right opposite sides of the region bridging the two structures can be in suspension. 触控装置4在一些实施例中还可包括基板49，基板49在一些实施例中可为触控装置4的主板，该二开关装置45分别设置于基板49上与第一穿孔434及触发部4125相对的位置，二开关装置45与相应的触发部4125之间形成一定间隙。  In some embodiments the touch device 4 further embodiment includes a substrate 49, the substrate 49 in some embodiments may be a touch device of the main board 4, the second switching means 45 are disposed on the substrate 49 with the first perforation 434 and relative position of the trigger portion 4125, a gap is formed between the triggering portion 45 and the respective second switch means 4125. 可以理解地，在另一些实施例中，开关装置45与触发部4125的位置可以互换成开关装置45在上，触发部4125在下，当开关装置45相对应侧的触控板组件41在外力作用下上下浮动时，开关装置45将碰触到相对应侧的触发部4125从而产生触控信号。 It will be appreciated, in other embodiments, the position of the switching means 45 and the triggering portion 4125 may be interchanged to switch means 45 in the trigger lower portion 4125, when the switching means 45 corresponding to the touch panel 41 in the external side of the assembly when fluctuate under the action of the switching means 45 touch the side of the portion corresponding to the trigger 4125 to generate the touch signal. 请一并参考图5，当触控板410的左或右区域受外部按压时，触控板组件41的相对应侧将下沉到一定距离，此时相对应侧的触发部4125通过间隙与相对应侧的开关装置45触碰。  Please refer to FIG. 5, when the left or right area of ​​the touch panel 410 is pressed by an external, corresponding to the side of the touch panel assembly 41 will sink to a certain distance, this time corresponds to the trigger side portion 4125 touch switch means corresponding to side 45 through the gap. 当按压到触控板410上的按压力消失时，触控板组件41的相对应侧恢复到自然状态，相应侧的开关装置45与相应侧的触发部4125接触断开，此时完成触控指令。 When the touch panel 410 is pressed to the pressing force disappears, the touch panel 41 of the assembly side corresponding return to its natural state, in contact with the respective side 45 of the respective side of the switching device triggering portion 4125 is turned off, the touch is completed at this time instruction. 由于触控板组件41的中部在架接结构的作用下被固定，因此在受外部按压时该触控板组件41的中间区域不可按压，而位于架接结构两相对侧的左右两区域能在外力作用下绕架接结构上下浮动。 Since the middle of the touch panel assembly 41 is fixed to the frame under the action of the attachment structure, and therefore in the middle region by external pressing the touch panel assembly 41 is not pressed, the attachment structure located on opposite sides of the frame can be left in the two regions Mountings structure fluctuate around an external force. 触发部4125就会触发相对应侧开关装置45产生触控指令，在有些场合下也可以不需要用软件辅助就能完成该触控装置4的左右键功能，防止误触。 Triggering unit 4125 triggers 45 corresponding to the instruction generating the touch-side switch devices, in some applications the need for software to be able to complete the secondary left and right button functions of the touch device 4 to prevent inadvertently. 再者，由于触控板410的左/右区域是借由相对触控板410横向设置的架接结构实现悬空的，左/右区域靠近键盘的侧缘可以不被限制，如此，则在有些场合下，用户的手指放在键盘上而不离开键盘时，也能够方便地按动触控板410的左/右区域往下转动，实现触控装置4的左/右键功能，带来了较大的便利，这一点对于大尺寸触控装置4而言尤为如此。  Further, since the left / right area of ​​the touch panel 410 is realized by means of bridging the transverse structure relative to the touch panel 410 disposed vacant, left / right side edge region near the keyboard may not be limited, so, then in some cases, the user's finger on the keyboard without departing from the keyboard, it is possible to easily press the touch panel 410 of the left / right rotation downward region, to achieve the left touch device 4 / right function with to greater convenience this is especially true for large-size touch device 4 terms. 本技术领域的普通技术人员应当认识到，以上的实施方式仅是用来说明本发明，而并非用作为对本发明的限定，只要在本发明的实质精神范围之内，对以上实施例所作的适当改变和变化都落在本发明要求保护的范围之内。  skilled in the art should appreciate that the above embodiments are only used to illustrate the present invention and are not used as a limitation of the present invention, as long as within the true spirit of the invention, the above embodiments within the appropriate changes are made and variations fall within the scope of the invention as claimed. 1. 一种触控装置，包括触控板组件以及二开关装置，其特征在于：还包括架接结构，该架接结构设置于该触控板组件的中部，将该触控板组件分隔出分别位于该架接结构两相对侧的第一区域与第二区域，并使该第一区域与该第二区域呈悬浮状；该二开关装置分别与该第一区域以及第二区域对应设置，以分别通过该第一区域以及第二区域的上下浮动触发。 A touch device includes a touch panel assembly and a second switch means, characterized by: further comprising a holder attachment structure, the stand attachment structure disposed in the middle of the touch panel assembly, the touch panel assembly partitioned are located in the first frame and second regions on opposite sides attachment structure, the first region and the second region in suspension; the two switching means provided respectively corresponding to the first region and a second region, down to the first region and the second region are triggered by floating. 2.如权利要求I所述的触控装置，其特征在于：所述触控装置还包括用于承托所述触控板组件的支架，所述架接结构设置于该支架与该触控板组件之间。 2. The touch device according to claim I, wherein: the touch device further comprises a bracket for supporting the touch panel assembly, the attachment structure disposed on the frame holder and the touch between the panel assembly. 3.如权利要求2所述的触控装置，其特征在于：所述架接结构包括设置于所述触控板组件与所述支架相对表面上的第一凸台，该第一凸台与所述支架抵接。 The touch device according to claim 2, wherein: said attachment structure comprises a frame disposed on the touch panel with the holder assembly relative to the first surface of the boss, the first boss and abutting the stent. 4.如权利要求I所述的触控装置，其特征在于：所述架接结构呈纵长形。 The touch device of claim I, wherein: said frame attachment structure vertically long shape. 5.如权利要求4所述的触控装置，其特征在于：所述架接结构横跨所述触控板组件。 The touch device according to claim 4, wherein: said frame attachment structure across the touch panel assembly. 6.如权利要求5所述的触控装置，其特征在于：所述架接结构包括两相对的端部，该两相对的端部分别延伸至所述触控板组件的两相对侧。 6. The touch device according to claim 5, wherein: said frame attachment structure includes two opposite ends, two opposite ends of the portions extending to the two opposite sides of the touch panel assembly. 7.如权利要求3所述的触控装置，其特征在于：所述架接结构包括设置于所述支架上与所述第一凸台对应的第二凸台。 The touch device according to claim 3, wherein: said frame structure comprising a contact disposed on the second bracket and the bosses of the corresponding first boss. 8.如权利要求7所述的触控装置，其特征在于：所述第二凸台的表面与所述第一凸台的表面紧密贴合。 The touch device according to claim 7, wherein: said second surface of said boss with a surface of the first boss into close contact. 9.如权利要求8所述的触控装置，其特征在于：所述第一凸台与所述第二凸台通过一锁固件将两者锁固。 9. The touch device according to claim 8, wherein: said first boss and the second boss by a locking member locking the two. 10. 一种电子装置，包括本体以及设置于该本体中的触控装置，其特征在于：该触控装置为权利要求I、任何一项所述的触控装置。 10. An electronic device, comprising a body and a touch device is provided in the body, wherein: the touch device as claimed in claim I, in any one of the touch device.